Both systems of carpet cleaning can achieve excellent results; the main difference is the amount of water used in the cleaning process. Ultimately, the results obtained by both carpet cleaning systems depend more on the technician, the chemicals and the equipment than the method used. 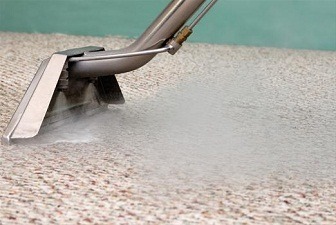 Steam cleaning, or hot water extraction cleaning, works by injecting hot water into the carpet under high pressure and then extracting that water out. When the water is removed, the dirt and soiling will be extracted with the water to clean the carpet. Sun Dry Carpet Steam Cleaners will always pre-treat stains to remove with the proper cleaning agents and use a pre-spray to break down any surface tension in the carpet; this will allow the water to penetrate deeply into the carpet before the extraction process. Steam cleaning can deliver excellent results if the technician doing the cleaning uses effective cleaning pre-sprays, agitates the carpet and takes the time to extract as much water as possible from the carpet. However, steam cleaning can leave the carpet damp, and it will usually take 4 to 24 hours for the carpet to be completely dry. Also, without effective pre-treatment, steam cleaning is often ineffective at removing oily stains (the dark spots we see on the carpet). If the oily residue is not totally removed, then the stain may remain, or it will quickly re-appear as dirt sticks to the oily residue. With the carpet dry cleaning process, the carpets firstly need to be pre-vacuumed to remove any dry soils. The pre-vacuum needs to be performed before steam cleaning too; as when soils become wet they will turn to mud and are (as a result) harder to extract. The carpet is then treated with a carpet dry cleaning solution, which is a combination of dry cleaning solvents mixed with water. The carpet dry cleaning solution is used to break down any oily residue in the carpet; this residue is what holds the dirt on to the carpet fibres. The cleaning process involves the use of cotton absorbent pads that are soaked in hot water with a conditioning rinse; the pads are placed on the carpet using a rotary machine (it looks like high-speed floor polisher). The pads are the rotated around on the carpet at high speed; the dirt is extracted from the carpet on the cotton pads. For the best results, the pads need to be regularly changed during the cleaning process. Carpet dry cleaning leaves the carpet dry enough to walk on in a few hours. The carpet dry cleaning solution is the most important part of this cleaning method. The best dry cleaning solutions will remove more stains than other cleaning processes and deliver excellent results.